Simplicity is the key to this exciting slot. Click here to play! There are several ways to win, and no pesky extra symbols to distract you from your ultimate goal of taking home the massive cash payouts. 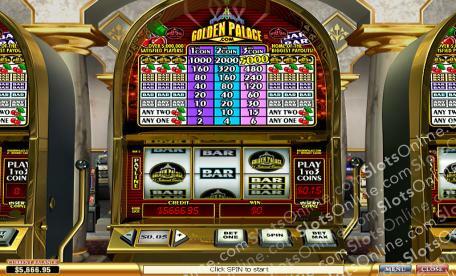 Golden Palace is a classic 3-reel slot played across a single pay line, with 8 unique winning combinations to take advantage of. There are no Wilds, Scatters, or Bonus symbols, so you can instead concentrate on the old favorites like Bars and Cherries to win you a stack of cash! There is nothing better than a simple, traditional slot; so sit back, relax, and enjoy the exciting winnings at Golden Palace slots!